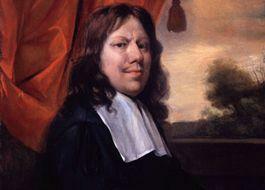 On the left is one of the few self portraits in which Steen displays himself in formal attire. 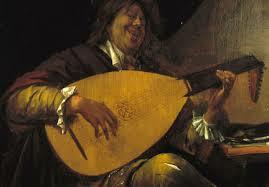 His art generally portrays him as a man who is in love with life, which is more accurately displayed by the joyful rendition of him playing the lute in the self portrait on the right. 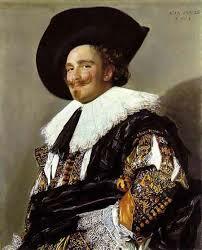 Steen’s characterisation is one of his strengths. The expressions captured in the next two pictures epitomise the Christmas spirit and the chaos of family gatherings. 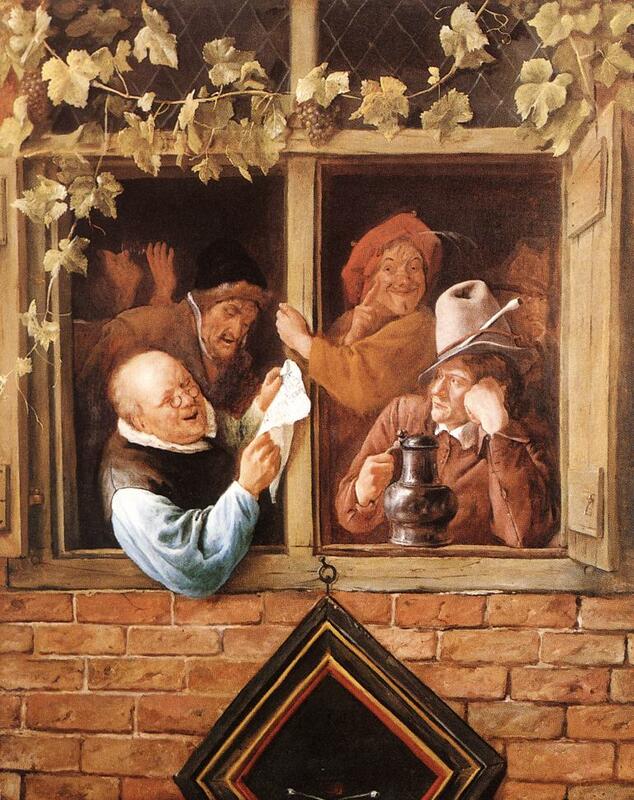 The characters in Rhetoricians at a Window also tell a story. Rhetoricians were drama and literary groups and here we have a member reading from a script, the author of which is probably the man looking over the reader’s shoulder. Unseen by the author is the look of glee (it’s either very good or is total drivel) while on the right could be either a critic listening intently or a dragooned member of the public who appears bored out of his mind. 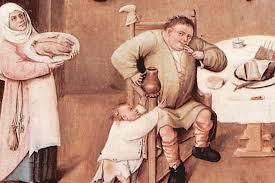 In the background is a jester who is milking the situation for all it is worth. 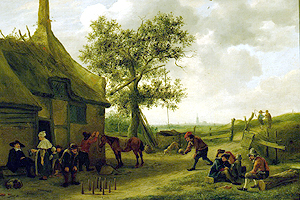 The scene is set in a tavern – there is a figure in the background on the left drinking from a tankard. 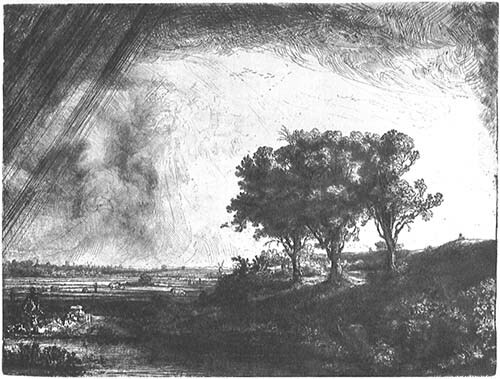 He had a somewhat ‘divine’ sense of humour, portraying biblical scenes against 17th century Holland sometimes even using inscriptions to make sure the point of the picture was understood! 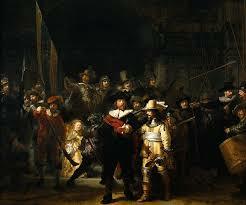 A picture is worth a thousand words and each of his pictures tells a story and his art is well worth exploring! 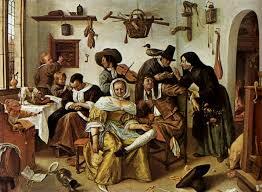 Tucked in amongst all the merry revelry, Steen moralised in a subtle way, Here is the description as written up on the Metropolitan Museum site: This painting depicts a “Jan Steen household”, a standard by which all later family dysfunction may be measured. 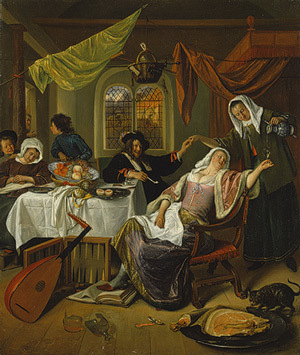 The lady of the house tramples a Bible while having her wineglass refilled. 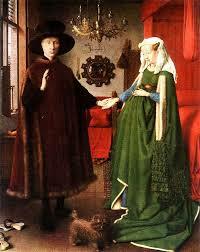 Her husband and the maid join hands in a gesture suggesting service beyond the call of duty. 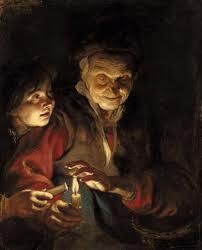 The boy in blue fends off a beggar at the door, thus recalling the Parable of the Rich Man and Lazarus, in which the more fortunate figure goes to hell. 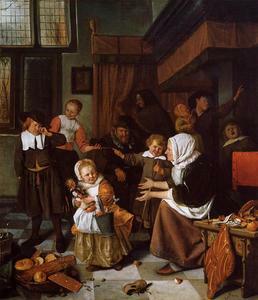 Fate hangs over the family’s head in the form of a basket holding a sword and switch (signifying justice and punishment), a crutch and a can (forecasting poverty) and a wooden clapper (used by lepers and the plague-stricken). 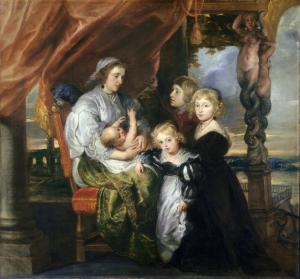 In this (sixteen-) sixties sitcom, Steen himself stars as the father, his wife Margriet van Goyen as mom, and their sons Thaddeus and (next to grandma) Cornelis as themselves. 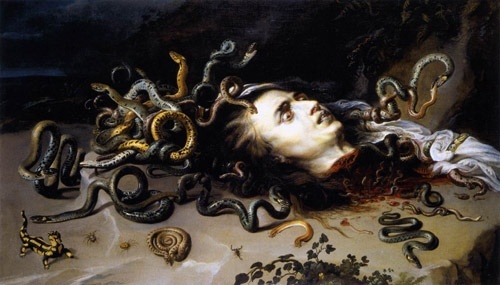 ‘Beware of Luxury’ is of particular interest as interpretations vary depending on the perspective of the viewer. 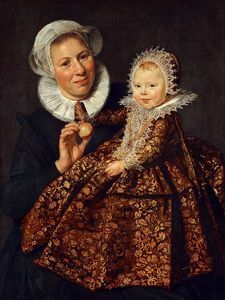 It has been used by the US National Library of Medicine comparing 17th century times with modern living and pointing out the similarities with regard to hygienic practices. 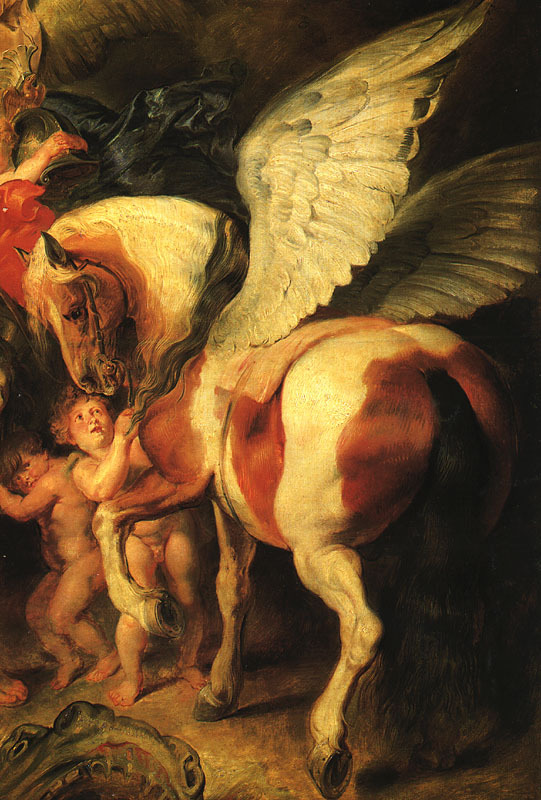 On the other hand, it is also a painting full of allegorical meaning as interpreted in a well researched blog by jonathan5485. 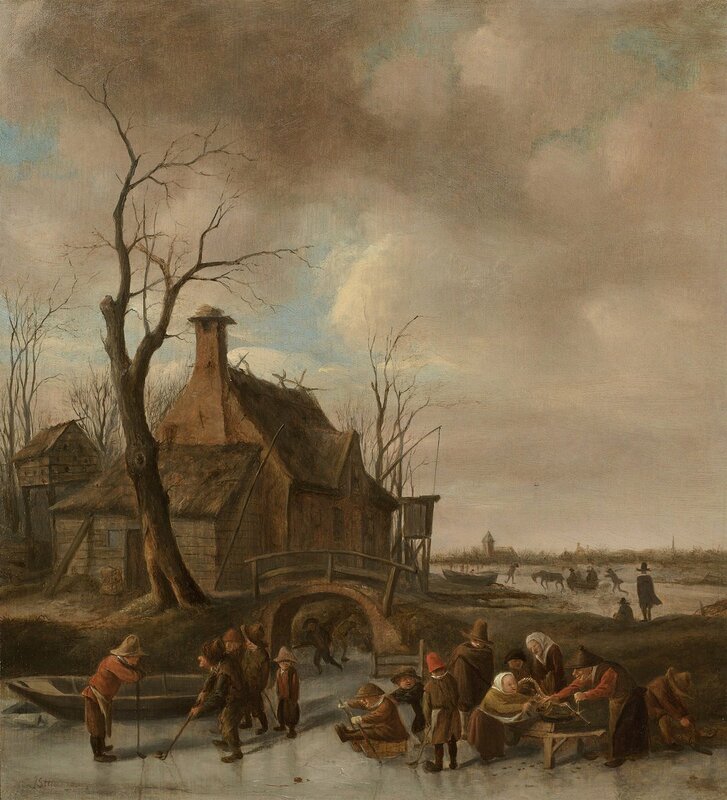 Steen’s landscapes, of which he did not do many, are invariably peopled as illustrated by “A Winter Scene” and “Game of Skittles”. 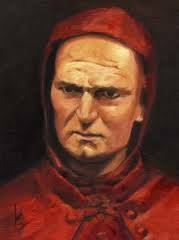 Any person with a wide ranging interest and profound knowledge of many different disciplines is described as a Polymath, but there have been none from his time to this, who can match Leonardo! 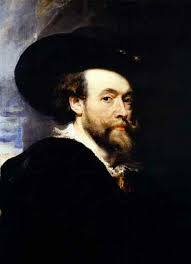 Painter; Architect; Inventor; Scientist; Mathematician; Engineer; Writer; Botanist; Musician; Sculptor; Mechanic; Geologist; Cartographer; Town Planner and Anatomist. 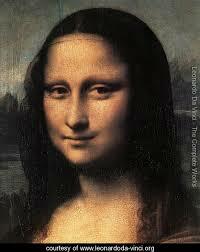 Da Vinci is probably best known for his painting of Mona Lisa which hangs in the Louvre in Paris. 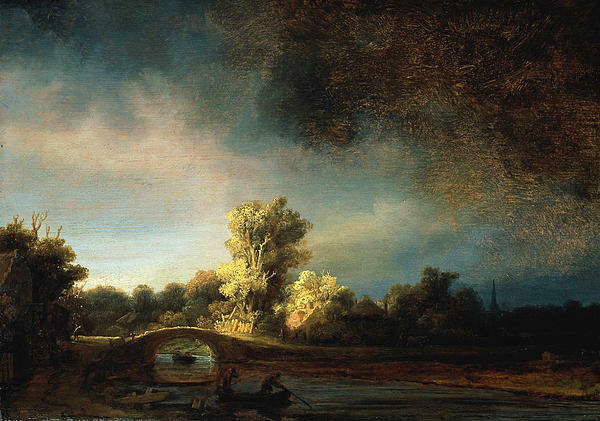 This is probably the most controversial painting in its 500 year history. 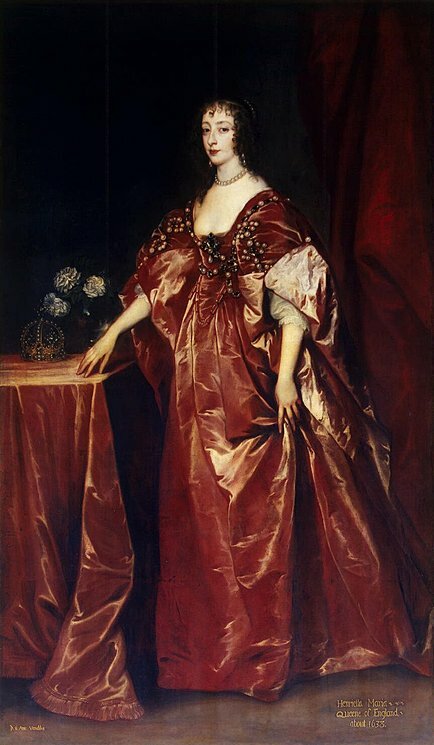 Debate has raged endlessly about her lack of eyebrows (thought to be the fashion at the time), the enigmatic smile and the identity of the model. There is a school of thought that the model was actually a male. 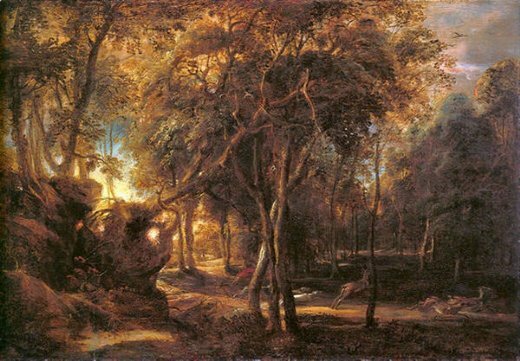 He paid meticulous attention to detail in all his work, as demonstrated by the perfect representation of the plants in his painting of the Virgin of the Rocks. 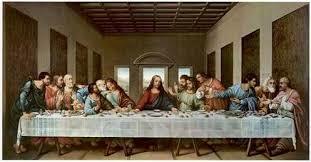 Although painted on a wall, The Last Supper is an atypical fresco as Leonardo experimented by sealing the wall then treating his work as if he were painting on wood. 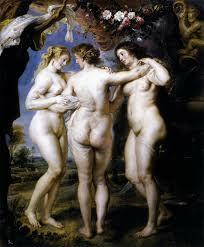 To this day, despite extensive restoration, efforts are still being made to maintain the integrity of this masterpiece. 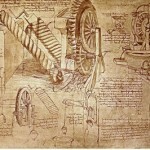 Leonardo’s love of mathematics is conveyed by the perfection of the perspective and the balance of each group of three. The intricacies of the fine details displayed in the lacework on the cloth, the clarity of the glassware, the soft glow of the pewter are remarkable. 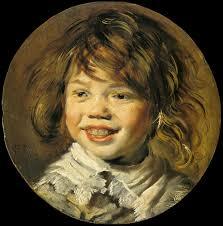 There is also controversy surrounding the interpretation of this work. Debate centres on whether it portrays the consecration of the bread and the wine, or whether it shows the reaction to Christ’s pronouncement of betrayal is ongoing. 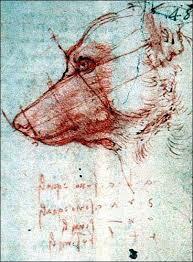 Some scholars feel that through the sheer brilliance of Leonardo’s interpretation, it is both. In the following two examples, one of a plant and the other of a dog’s head, we find how Leonardo applied mathematical equations and geometry to everyday things. 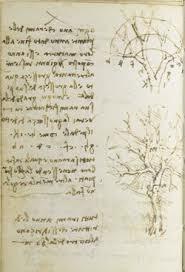 For example: Leonardo claimed “that each year when the branches of plants have concluded their maturation, when added together, the sum total of their cross-section is equal to the cross-section of the trunk.” This is illustrated by the image where you can also see his peculiar style of writing everything backwards. 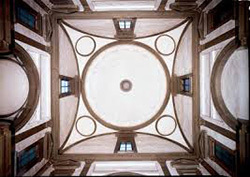 A Roman architect named Vitruvius, who lived circa 1 BCE, was the first to propose the theory that a human body could fit inside both a circle and a square. 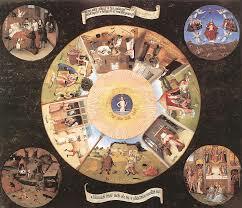 He associated the circle as being symbolic with the divine and the square with secular aspects. 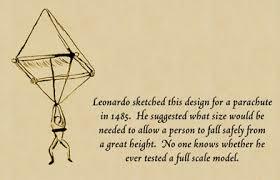 Leonardo, in his famous drawing expanded on this theory by using his knowledge of maths and anatomy to illustrate perfect proportions. 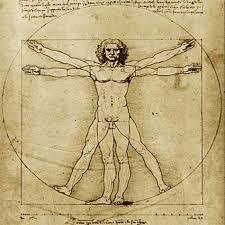 The Vitruvian Man shows how the human body can be fitted perfectly within both a circle and a square. 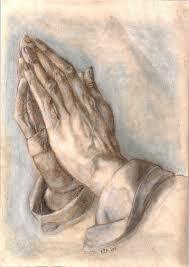 This drawing is now more commonly associated with health practices wishing to epitomise the fully balanced body. 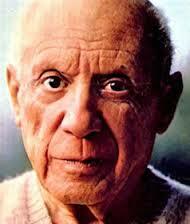 The sheer brilliance of this man led him in many different directions. His vision of how a town should be planned demonstrated how the logics of mathematics could be applied to engineering projects, while he used the eye of the artist to combine beauty with practicality. 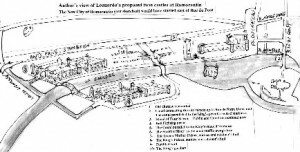 His plan, for which he adapted the principle of Archimedes Screw, featured fresh water inlets as well as waste disposal and all homes had running hot and cold water. He created machines to improve ventilation and even had pipes running through the walls of the buildings for heating and cooling the rooms. 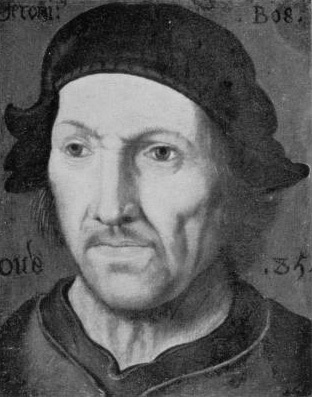 He designed automatic opening doors and to quote from The Last Years by Ton Pascal: The heavy main doors of each building, opened and closed automatically when approached, using sophisticated balance and pressure points on a crank mechanism system, only now put to use with the advent of computers. 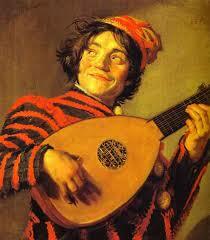 Included in his plan were schools and centres for recreation. He paid attention to open spaces, avenues were lined with trees, artwork was displayed on corners and numerous fountains added to the ambience of a city that would be interactive with its residents and allow its residents to be interactive within it. 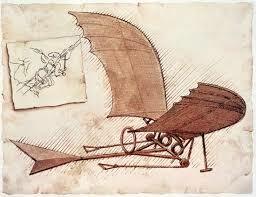 This is one of many inventions that Leonardo recorded in his Portfolios. His design for a flying machine was based on his observation of birds in flight, and the ‘bat’ wings bear testimony to this. Everything about the design was carefully calculated allowing for balanced body weight and various cranks for levitation and direction. The only flaw was that manpower alone could never have got the craft off the ground! However, the man’s mind did not stop working at this point. 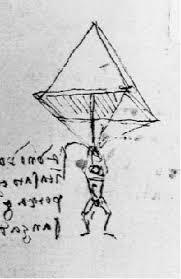 He figured out that there should be some sort of safety device in flight, and designed a parachute. This parachute was recently tested (although the jumper also wore a backup ‘chute). It descended perfectly, the only issue being that it could not be steered or adjusted to accommodate the prevailing conditions. This extract form online Britannica, written by Ludwig Heinrich Heydenreich, presents a lesson from the Master himself. 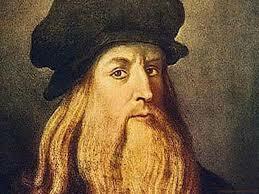 Visit the “Leonardo Links” page where you will find a select choice of sites which will give you further insight into this amazing man. 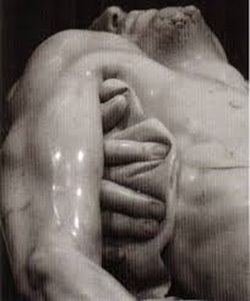 Michelangelo was only 25 years old when he created Pietà (Compassion or Pity) from a single piece of Carrara marble. 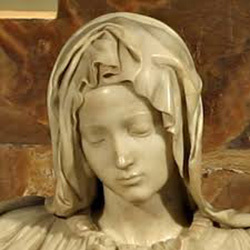 The statue was commissioned as a memorial to be placed on a tomb. 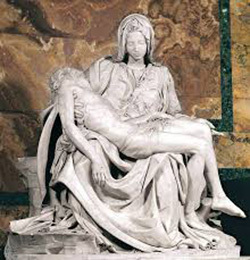 The term Pietà applies to any depiction of Mary and the body of Christ whether it is a sculpture or a painting. 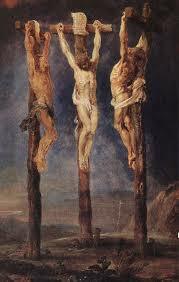 The mastery of this extraordinary young man is revealed in the meticulous attention he paid to detail as shown in the delicacy of the veins on Christ’s hand, and the precision of the nails and tendons on Christ’s feet. 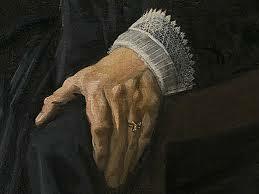 The flow of the folds is remarkable as is the tension in Mary’s hand holding the body. 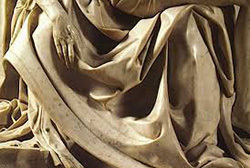 Here too, the definition of the arm muscles and the fold in the flesh in response to Mary’s hold is incredibly detailed. 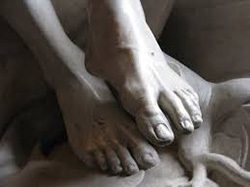 Michelangelo hit a problem with proportions to which he found a creative solution. 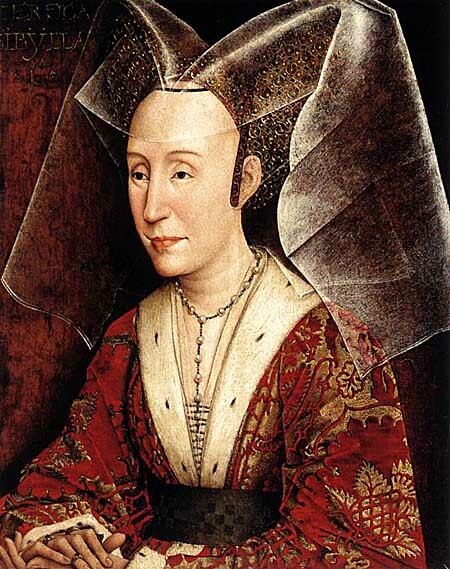 Mary’s head is rather small for the size of her body. 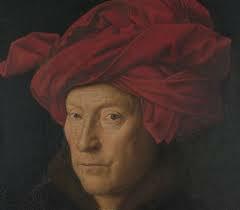 If he had carved it in proportion to her body, she would have been 15 ft (4.5m) tall, so he bulked it out by covering her head in draped cloth to balance the rest of the body. This figure of male perfection is probably one of the most famous statues in the world which took Michelangelo two years to complete. Standing at nearly 14ft (4.2m) tall it is carved from a single block of marble which had lain abandoned for over 25 years as no other sculptor was prepared to work with it because of the proliferation of flaws. The statue weighs over 4500kgs (nearly 12500lbs) and it took 40 men four days to drag it a couple of blocks. 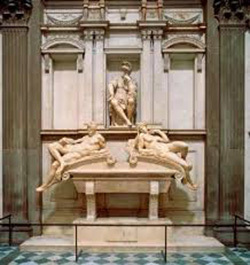 The marble was originally intended to be one of a series of statues to be placed in the niches in the Cathedral of Florence. 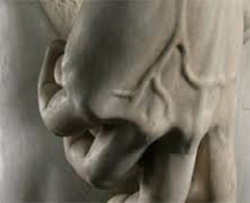 The other sculptors feared that the flaws would compromise the stability of such a statue, but not the 26 year old Michelangelo. 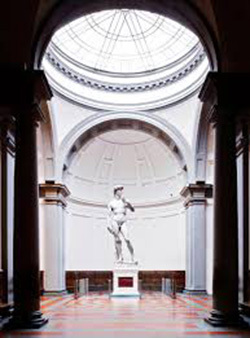 Other statues of David depict him after his battle with Goliath, but not Michelangelo who chose to sculpt a contemplative David, armed only with his sling before the mammoth encounter. 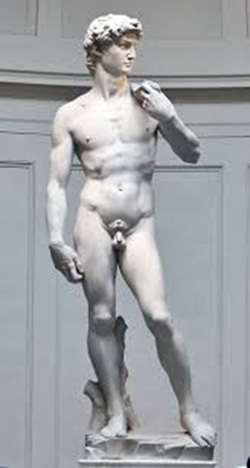 The statue portrays the tension David was experiencing but also exudes his confidence in himself. When one looks at busts and some statues, the eyes are often blank orbs. 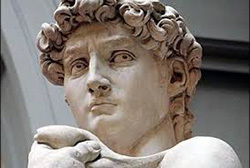 Michelangelo carved the pupils and irises which add to the intensity of David’s look. 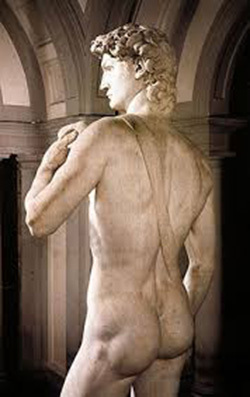 The detail of the musculature in David’s back is phenomenal. Little wonder that this statue is regarded as perfection. 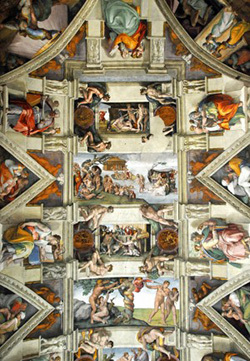 Michelangelo was very reluctant to take on the commission of painting the ceiling of the Chapel. 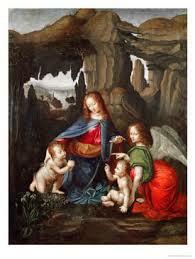 He felt that he was more of a sculptor than a painter, and secondly he had limited knowledge about painting a fresco. 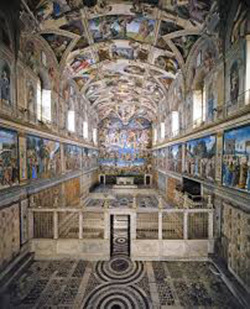 Frescos are created when paint is applied to wet plaster. 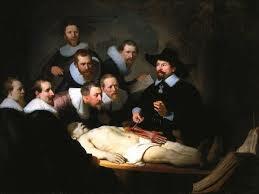 He must have got the formula right as it has stood the test of time, unlike da Vinci’s Last Supper which has had to have extensive restorative and preservative work. 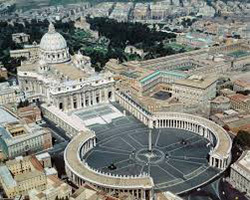 Since 1492, the Chapel has been the enclave where the cardinals gather to elect a new pope. 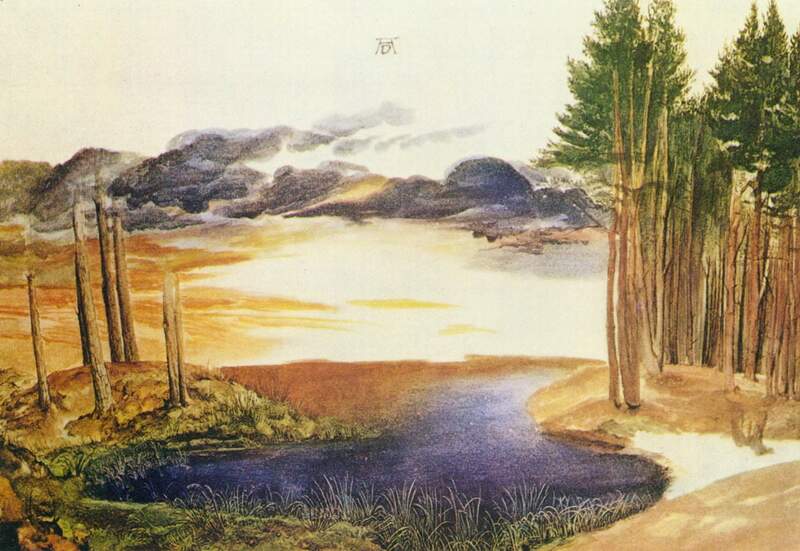 The nine central panels take one through the story of Genesis. 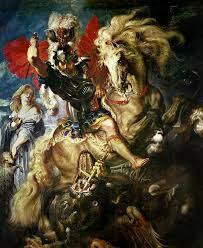 On either side are a series of Old Testament characters mixed with a few of the pagan figures which were regarded as also being prophets leading the way to the advent of Christ. 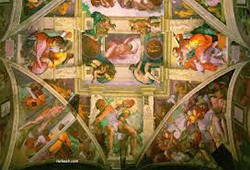 The Michelangelo Links page has sites which take you on virtual tours, with highlighted details of all the frescos in the Sistine Chapel. 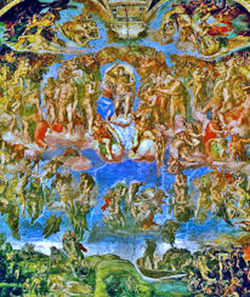 20 years after painting the ceiling, Michelangelo was commissioned to paint “The Last Judgement” above the altar. 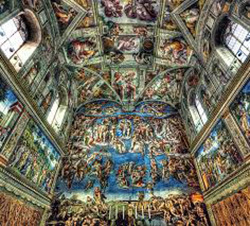 As he had done earlier with the ceiling, Michelangelo chose to represent both saints and pagan figures in this fresco, and in later years this upset some of the prelates who commissioned the ‘naughty’ bits to be covered up. 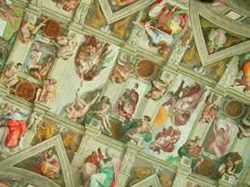 Recent restoration has cleared the fresco of all these additions. The library was built on top of an existing convent. 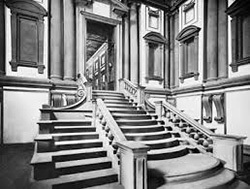 The staircase appears to flow up to the Reading Room in a style described as Mannerist Architecture and the entire room in which it is built is dedicated to it. 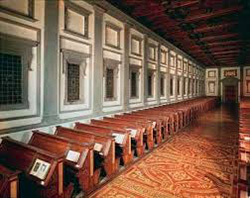 He also designed the benches, made of walnut – the backs of which form lecterns. The floor is a mosaic made from wood. 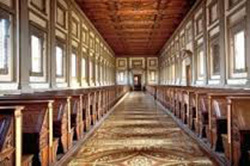 The Library was built to house the Medici Collection which is contained on a separate floor. The chapel is a mausoleum, and is an extension of the San Lorenzo Basilica. 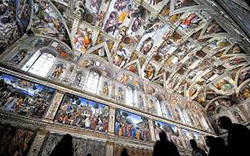 It is the only completed architectural structure in which Michelangelo was involved. Again he used architectural illusion, this time to make the room seem larger and higher. This project involved either the creation or the restoration of three buildings. 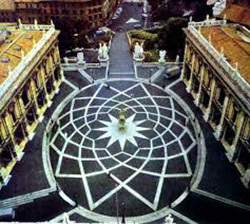 The building is now the City Hall and fittingly, tucked into a niche at within the apex of the stairs is a statue of the goddess Roma in whose hand is a globe symbolising the far reaching power of Rome in ancient times. 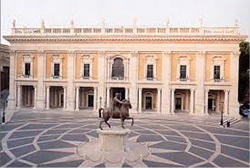 A bronze statue stands at the centre of the courtyard. It is a reproduction of what is thought to be the only surviving bronze statue from bygone age which was relatively intact. 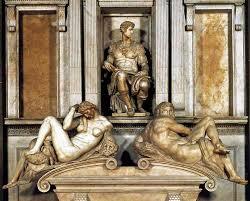 Michelangelo designed the plinth on which it stands. 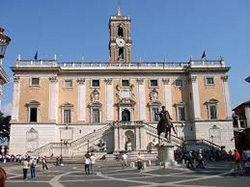 The original statue is in the Capitoline Museum. 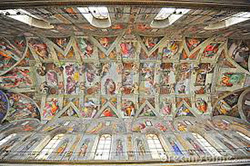 Michelangelo moved the tower to a central position which served as an additional focal point to the stairs. The flat roof is a signature of Michelangelo’s architecture and the effect of the added pilasters serve to unite the two storeys. 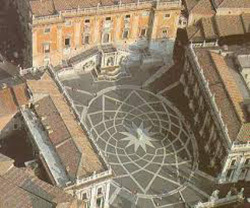 The starburst design whether viewed from above or laterally seems to pull the surrounding buildings in to create a more intimate space. It also creates an optical illusion. 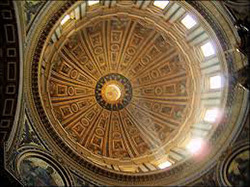 Michelangelo designed the dome, construction of which started in 1547, but did not live to see its completion in 1590. 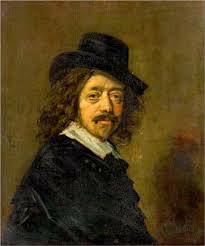 He died at the age of 89 in 1564. 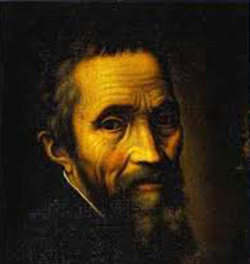 Please go to the Michelangelo Links Page where you will find additional sites covering all his achievements plus links to clips and videos with plenty more information about this fascinating and extraordinarily talented man. 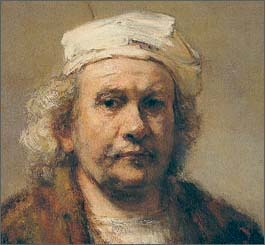 Artists from the 1200s through to 1800 are considered to be ‘Old Masters’ although the definition of both artists and this time period are disputed. 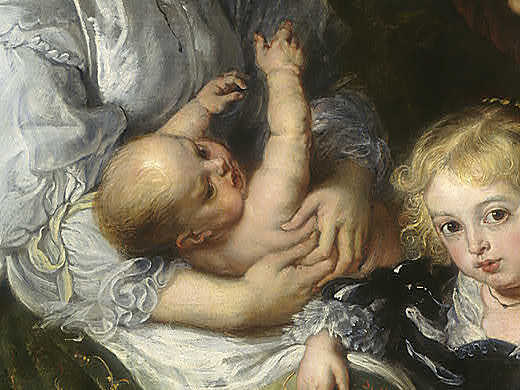 However, whatever the genre – these artists generally fall under the entire Renaissance movement which developed the Middle Ages. 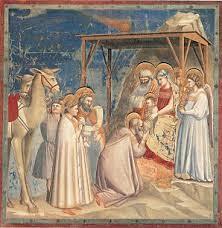 The early Byzantine artists focused mainly on religious themes and during the late 1100s through to the mid 1400s we see the first notables like Giotto, Bosch and Dürer emerging. 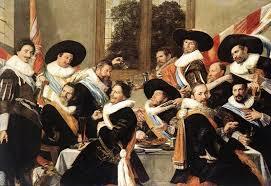 Their style is more ‘human’ in its approach, with less gold and far more vivid colouring. 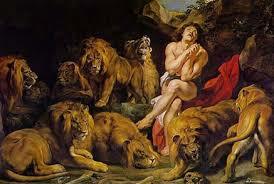 These works are sometimes referred to as being Gothic in style where great attention is paid to detailed symbolism. 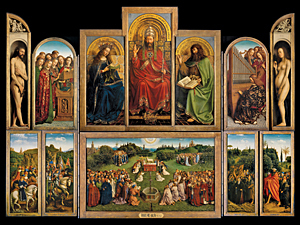 The paintings were often narrative and the fashion at one time was to present them as three panels – known as a triptych – which read from left to right. 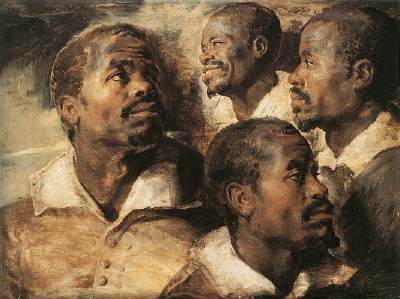 These early artists had not yet begun to explore human anatomy but their work displays a variety of human emotion in the facial expressions. The architecture of this period is elaborate and intricate and many buildings – mainly churches of which Notre Dame is an example – are still standing. 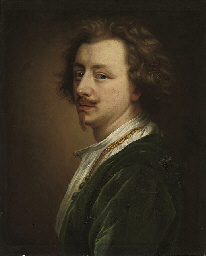 Please click on the links page to see further illustrations of the work of artists and architectecture as well as more in depth biographical details. 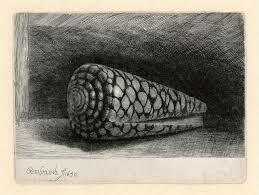 Although his talent is unquestionable, throughout the centuries, analysis of Bosch’s work is varied with wide-ranging interpretations of the obscurity of his symbolism. 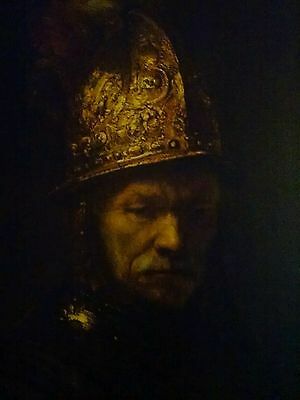 The latest research, however, presents Bosch as one of the first representatives of the abstract form as well as having an incredible insight into human nature. 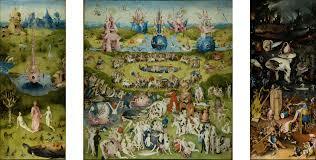 INTERESTING FACT: “I’ve always thought of L.A. as the modern version of The Garden of Earthly Delights,” says author Michael Connelly who named his detective, ‘Harry’ Bosch, after the artist. 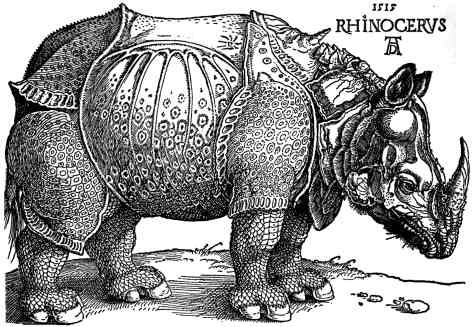 Dürer was a talented painter, draftsman and writer but is best known for his engravings and woodcuts which he took to a new level. 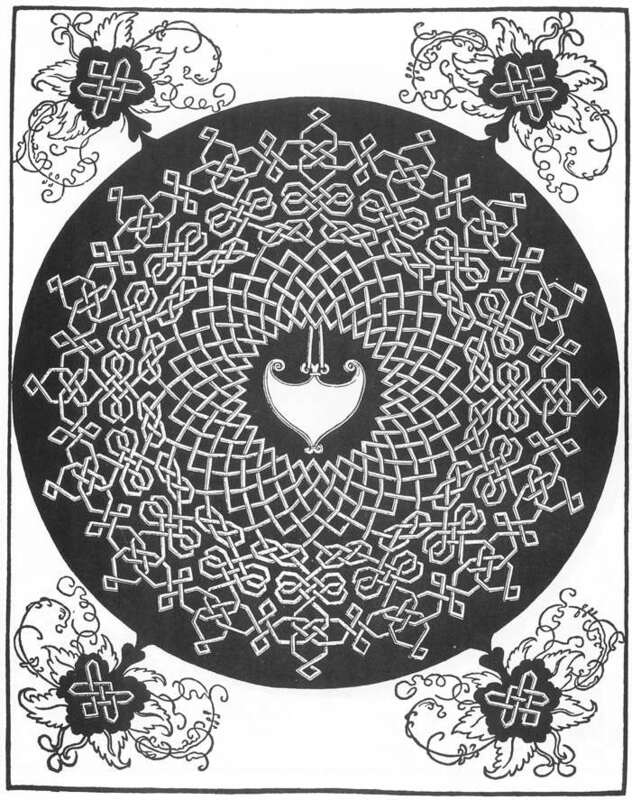 Woodcuts were used to illustrate books but Dürer developed them into an art form giving them depth and perspective. 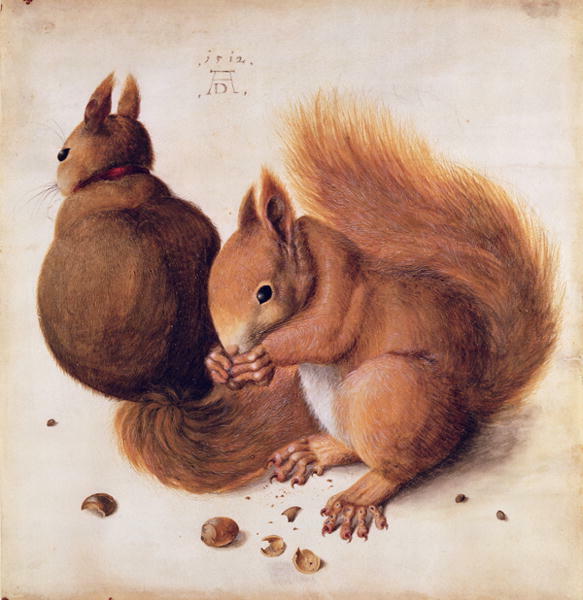 Dürer also excelled at watercolours.